Home / Break My New Pointe Shoes?!?!?! Wait! I just spent $90 on new pointe shoes and you want me to WHAT? Well, “break in” your pointe shoes would be the more accurate way to phrase it. I have been approached several times about this topic: How do I break in my pointe shoes? In addition to that, I see many lovely students with wonderfully arched feet. But when they go from their soft technique shoes to their pointe shoes, I often wonder where that beautifully arched foot went. It is disguised by a really hard shank that has not yet been broken to match the natural arch. Learning how to correctly and effectively break in your pointe shoes is critical. Not doing so will hinder your efforts in learning how to dance on pointe. A dancer, up until she gets her prized pointe shoes, spends all of her in-studio time wearing soft technique shoes. Some prefer the split sole technique shoe. They feel that it shows off their pointed foot better. So, when you get your first pair of pointe shoes – and there is nothing soft about those – you cannot just strap them onto your feet and expect to manipulate your foot in the right way … much less rise up on top of the box completely. As a result, breaking in your pointe shoes is an imperative task with many benefits. Helps to form the pointe shoe to your foot. Allows you as the dancer to roll through your foot. 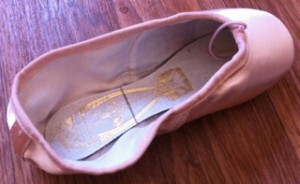 Reduces the amount of noise the pointe shoe will produce. Enables you to get fully up on pointe. The three elements to breaking in pointe shoes that I will discuss are the shank, the box and the process of reinforcing with glues. Now, grab your beautiful, shiny, satin-stiff slippers and work along with me as we break in your pointe shoes! Element #1: Shank. Not Plank! Don’t let your shank look and feel like a plank. In order to break your shank in the exact location needed for the arch of your foot, look at where your foot bends. Is it right near the heel? Does yours bend more in the middle? Mark your break with a pen. Step 1: Mark your break with a pen. Make that same mark on the inside of your shoe. This is where you will break your shank. 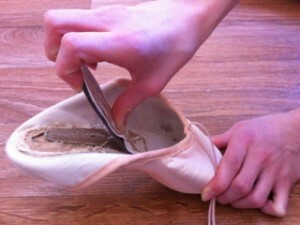 Step 2: Mark the break inside your pointe shoe. Pry the shank up and bend it back and forth making it malleable. 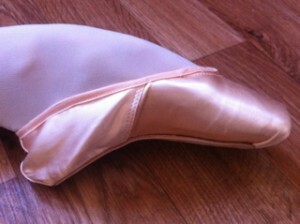 Step 3: Bend your pointe shoe to make it malleable. Don’t become alarmed by the popping sound it may cause, but do be careful as there may be a nail that you will need to remove. Step 4: Remove any nails. Done! Slip on your shoe so you can see how the shank is taking on the natural shape of your foot. Step 5: Slip on your shoe for a fitting. Element #2: Think inside the box! The box (the painful part!) 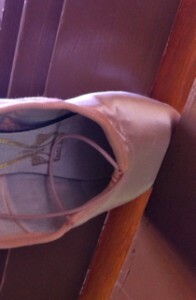 of a pointe shoe needs some working on, too. The whole idea is to get the shoe to work with and not against you. You want to either step on the box with your heel or close it in a door. Step 6: Work the “box” by stepping on it. Step 6: Work the “box” by closing it in a door. This will flatten the box out a tad making it supple and increasing the comfort. I always wanted to soften mine a bit more to really get the box to mold to my foot (it made my bunions not hate me so much, too!). To do this, keep a small squirt bottle in your dance bag. Fill it with water or rubbing alcohol. Spray it on the box where you need extra flexibility. Step 7: Use water to get extra flexibility. Walking around on demi pointe will help both the shank and the box to become more pliable. Element #3: Reinforce that which is broken! It is all about prolonging the life of these pricey “tools.” After VERY carefully opening your bottle of glue, drizzle some of the gooey substance down into the tip of the box. Step 8: Carefully drizzle glue into the tip of the shoe. Finally, pour some glue over the area of your shank that you feel needs added support. These steps can be repeated as many times as needed, or until it comes time to retire the shoe all together. There are two different kinds of glue that I would recommend to harden your pointe shoes. One is Jet Glue and the other is Hot Stuff. My belief is that Hot Stuff is harder, holds firmer. Others prefer Jet Glue because it has a super speedy drying time. Now, if you are newly on pointe you may want to hold off the gluing process until you feel that your shoes are no longer supporting you as well as you would like. If you are an old pro, I would recommend gluing prior to wearing your shoes, but after you have completed the steps with your shank and box. Now it is time to get out your needle and thread and sew away on your elastic and ribbons! Get ready for your pointe work to become more refined with all the added benefits discussed earlier. Have any further questions? I am here to help! Writer’s Note: For additional information about Central Pennsylvania Youth Ballet’s dress code for the academic year Preschool, Primary and Pre-Professional divisions and the 5-Week Summer Ballet Program visit CPYB.org. Hello Rebecca! Thank you so much for reaching out. Hopefully, you’ll find my answers to your questions most helpful. When you are preparing for a performance en pointe, my opinion would be to have two pairs of shoes, sewn, broken in and ready. Of course, this could vary depending on how many performances you are scheduled to do and how intense the dancing is. I’ve been refitted with Russian Pointe’s. Specifically the Almaz medium shank. I’ve tried pulling up the material on the shank to try to pry the shank but it’s really tough. I even had a male friend attempt and he couldn’t do it. Do you have any experience with Russian Pointe’s and how to break them in? I’ve been told they are bit harder to work with when breaking them in. Hello and thanks for contacting us with your question. Your new Russian Pointes surely seem to be giving you quite a challenge. Hopefully, this information will help you: While I do not have direct experience with the Russian Pointe brand, I’ve had experience with pesky pointe shoes. If your shank is not willing to be pulled up, I suggest just leave it be. Decide where you would like your shank to bend, be it at the 3/4 mark or halfway mark. Toss the shoes, one at a time, in the microwave oven for 10 seconds. Then using a counter top or wall corner (something hard/firm and with an edge) begin to apply pressure bending your shank back and forth until it increases its pliability. Repeat this with your other shoe. I recently got my pointe shoes and I was wondering how I can make the box more comfortable to dance in. My toes hurt while on them and after. Is there a way to add some cushioning? Or do I just need to break into them more? Hello Liliya! Thanks for reaching out with your question. 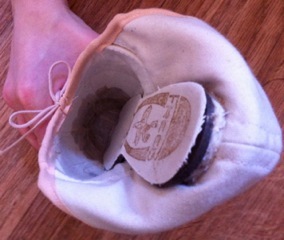 Pointe shoes can certainly be uncomfortable when they are new and especially when you receive your very first pair. Let me start by asking this — are you currently using any sort of padding in your pointe shoes? Ouch! I sure hope so! 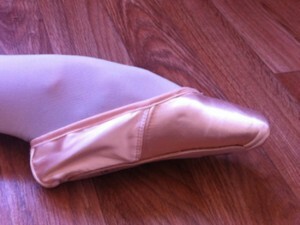 There are many options and ways for you to add padding in your pointe shoes, therefore making them more comfortable. My two recommendations would be to either use lamb’s wool or toe pads, and both can be purchased at any local dance shop or most online dance shopping sites. Lamb’s wool is loose wool that you pull out how much you need, wrap it over your toes, and slide on your pointe shoe. Over time that piece of lamb’s wool will lose its amount of padding, so just start your process over again with fresh wool. Toe pads, I will admit, are a tad easier to use. Toe pads come in a few varieties. There are foam rubber, gel and lamb’s wool options. Toe pads can also vary in size. You can purchase ones that cover all 5 of your toes, similar to the toes of a sock. But you can also purchase smaller toe pads that are sized for an individual toe. 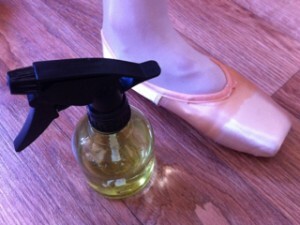 Spritzing the box of your pointe shoes around the vamp area with warm water will help to soften the box. Congratulations on getting your pointe shoes, and I hope ths information will help you. Remember, too, that your feet will get accustomed to pointe shoes the more you practice with them and the more you break them in. Lastly, if you have tried some of my ideas already, keep trying. There are several brands and options out there as I mentioned before. Sooner or later you will find what works for your feet. Keep dancing and enjoy!